If you would like to picnic, there are three picnic tables, one in the old quarry and two along the Glenfern Ridge Track, but you may choose one of the many quiet areas. Please take your rubbish with you. 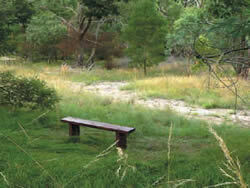 There are twelve seats, strategically placed to take in the various views and to rest in quiet surroundings. The area was in extremely poor condition in 2000 when a group of interested people got together to have this land preserved and rehabilitated. Many thousands of hours of both volunteer and council contractor time has gone into the works to date, which have seen spraying of Chrysanthemoides monolifera (Boneseed) and Rubus fruitcosus (Blackberry) that are prolific on the site. Click here to view the current schedule for our Bush Restoration and Midweek Conservation & Conversation mornings. Click here to view the recently updated Management Plan. View previous plan from 2004 here. Click here to view the 2015 document. Click here to view the 2010 document. Click here to view the list of flora. Click here to view the list of fauna. The first three of these areas contain vegetation that largely represents what would have been found before 1750. The plant list exceeds 200 indigenous species with many of regional significance such as the Yellow Star. 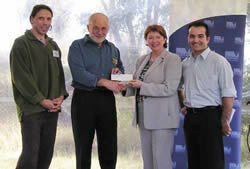 It forms a vital part of the bush corridor linking Ferntree Gully and Lysterfield National Parks. The Reserve supports at least seven fauna habitat types including Ferny Creek, Riparian Forest, Grassy Woodland, ephemeral wetland. This diversity of habitats plays an important role in providing habitat for numerous native fauna species.